Evangelical Textual Criticism: Review of David Daniels, Is the ‘World’s Oldest Bible’ a Fake? 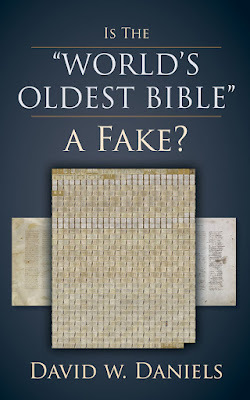 Review of David Daniels, Is the ‘World’s Oldest Bible’ a Fake? 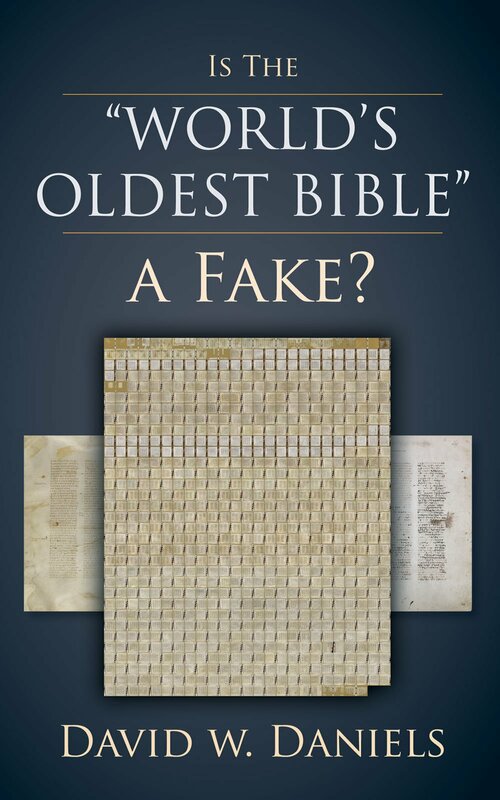 A couple of weeks ago during my trip to Denver for ETS/SBL, I read David W. Daniels’ book, Is the “World’s Oldest Bible” a Fake? I decided to write a review of it that I posted as an ‘unpublished’ review on academia.edu. In the book, Daniels attempts to argue that Codex Sinaiticus is a modern production (c. 1840s). This bizarre position has been a trend in recent years among KJV-only circles and even taken up by people I’ve known and respected for decades. In summary, David Daniels demonstrates over and over again that he is agenda-driven by a desire to undermine any opposition to the KJV, he cherry-picks references that he can twist in his favour without giving the full context (or without reporting information from the same works that he cites elsewhere that could undermine his point), and he has effectively zero experience with real manuscripts. I cannot recommend this book to anyone. One of the most striking things to me is how much Daniels doesn’t say. If you are on the fence about this issue, that should concern you—what Daniels is not telling you. To be clear, I don’t harbour any ill-will toward Daniels. In fact, I wrote a positive review of one of his other books, a biography of Jack Chick. That being said, I cannot recommend his book on Codex Sinaiticus to anyone. That is not because I’m opposed to finding out manuscripts are fakes. The Museum of the Bible is to be commended for removing some of its Dead Sea Scrolls after getting further tests done (let’s not forget that they were the ones who paid for these extra tests and have supported Kipp Davis’ investigations on their authenticity this whole time). Also, there was that other manuscript that caused a big stir and turned out to be a fake a few years ago. No, the problem with Daniels’ book is that it is built on one-sided reporting, conspiracy theories and a desire to defend the King James Version at all costs rather than the careful analysis, experience with manuscripts and expertise that normally leads to the identification of forgeries. See Kust/Wasserman, To Cast the First Stone, p. 186-192, for the recent literature on Sinaiticus, Vaticanus and imperial Bibles. Can you edit your reply to correct the author name? Thanks! This is definitely a movement in KJV circles. I was recently given a similar book (David Sorenson, _Neither Oldest Nor Best_) by a pastor and asked what I thought of it. Sorenson's book focuses on Simonides claim to have forged Sinaiticus. In searching for scholarly treatments of the issue, the only thing I came up with was J.K. Elliott, _Codex Sinaiticus and the Simonides affair_. Is that still the best book on the subject? In skimming/searching Knust/Wasserman, I didn't see any reference to the forgery question. Our book does not at all deal with this issue. It is on a very different topic. On the other hand, I am submitting a major article on Simonides’ forgery of NT papyri any day now. My intentions is to refer to the most recent *serious* literature on the Sinaiticus, of course. Aren't there enough real fakes to not need faking a fake? Oh dear; thanks for reading this so that the rest of us don't have to, Elijah! While I truly appreciate the Kjv and respect its textual lineage any attempt to undermine an important text as this Codex is in order to advance a text tradition which in and of itself need not resort to psuedo scholarship in order to defend its validity (Kjv) and place in the history of the text of the Bible has done the world and scholarship a great disservice indeed. Thanks for this review Elijah! Insomnia? The in-flight movie wasn't interesting? Is anyone in the NTTC field on that fence? Seriously? This may - and I say MAY - be where the local church and the academic world don't intersect at an important point. No, Dr Robinson, NOBODY with a functioning brain cell IN THE TC WORLD believes that Sinaiticus is a fake. The problem, however, is the Internet has given rise to an inverse level of inequality of scholarship that enables hacks with little more than active imagination and a keyboard to spread lies in the name of the truth. And unfortunately, the pastor who is not so well-versed in TC is confronted with what can only be called the cancer of KJV Onlyism replete with a nice colorful book. The average church member - unfortunately - believes almost everything he or she is told about sinister conspiracies that sound a lot like what they were told were things the devil might try to do. This mindset has given rise to such unfortunate superstition in the church as Mike Warnke's cartoonish Satanism tales or even "The Prayer of Jabez." One might well see dispensationalism's obsession with 1948 and "this generation" prior to the late 80s as a similar thing. In other words, this isn't something that a textual critic needs to read, but it IS something important as an antidote to the online nonsense and repeated question begging approach of the Small Clique of the Clueless With Keyboards. I found the review straightforward and necessary and supplementing my own review of Daniels's pretty poor effort. I mentioned in my own review the most egregious omission from Daniels's book is that he obviously has never read Elliott's work on Simonides, as it did not even make it into the bibliography nor does he appear to know this important fact because he passes on things the if he read Elliott he knows are untrue. However, I concur with Dr R in an adjacent sense because as I noted - for whom precisely was this monstrosity (referring to Daniels's book) written? Next thing I know you'll be telling me the claims about contrails and secret black helicopters aren't real and that the movie Conspiracy Theory wasn't based on an actual incident. Bill Brown I would like to read your review as well, since Dr Hixson makes reference to it and it addresses LXX but I can not find it any where. "The Museum of the Bible is to be commended for removing some of its Dead Sea Scrolls after getting further tests done (let’s not forget that they were the ones who paid for these extra tests and have supported Kipp Davis’ investigations on their authenticity this whole time)." On the other hand, MOTB has largely suppressed Davis' research about their fake scroll fragments. Are you suggesting that printing his "suspicions about the authenticity of the fragments" in the 2016 Dead Sea Scrolls volume (exact quote from p. 23) and taking him seriously enough to pay for further testing, ultimately removing them from the collection, counts as suppression? No, but I contend that other actions count as suppression. An overwhelming majority of the public will not read Davis' academic research, yet you will not find in the Museum any discussion of Davis' research, notably from Dead Sea Discoveries 24:2 (2017). If MOTB is going to claim to be educational, then in my opinion, it has a responsibility to explain why experts questioned the fragments' authenticity. They failed to do this. Additionally, in subsequent remarks concerning the fragment's authenticity, MOTB has glossed over Davis' research in favor of the scientific testing. Finally, in the short period that I served as a docent, MOTB explicitly forbade me from discussing Davis' research with museum guests. Official museum representatives gave me excuses that included, "You shouldn't overwhelm guests with too many facts." If they didn't want to suppress this information, then why prevent me from sharing the research that they were funding, especially when guests were asking these types questions? It seemed to me that, if guests were paying money to take a tour to learn about the DSS, then they deserved a transparent answer to sincere questions. That seems like suppression to me. That is awful. I wonder who says what in the MOTB? There is clearly a mix of people in the leadership, some of whom are clearly for transparency and reforms for better practices. I think they ought to organize an exhibition on forgery and highlight the story of the fake DSS scrolls, the testing but also the problems with provenance. I couldn't agree more about an exhibit. In my opinion, merely stating on a placard that some scholars question the authenticity of the Museum's "DSS fragments" does little to educate the public and downplays these scholarly concerns. Before the Museum and I parted ways, I encouraged this type of exhibit, but I had absolutely no sway and my concerns fell on deaf ears. So am not hopeful of change. I think that those who want transparency and reforms are handcuffed and have to tread lightly. However, I fear digressing too far from the original intent of the post. Thanks for the good work. It should be remembered that Nikolas Sarris uncovered in 2009 a fragment of the Codex in the binding of an 18th-century book. Simply saying a book shouldn't be read because it is one sided is like saying you can't find anything to defend your position nor find fault in the evidence which David Daniels presented. Just watch the videos and evidence that David Daniels posted on the ChickTracts channel on youtube. Hi Unknown, I am sorry for the delay in responding. I only just saw your comment. You are more than welcome to read what I actually said in my longer review that is linked in this post. I never intended to convey the idea that the book should not be read because it is one-sided, and I think that is clear at least in the full review. On the contrary, the book shouldn't be read because its one-sidedness has resulted in very poor research. Things that are blatantly wrong are presented as 'facts', among other problems. There is nothing wrong with a one-sided book in principle as long as it deals with the evidence. My impression from Daniels' book is that he omits, ignores or is otherwise unaware of evidence that hurts his case but is willing to accept uncritically *anything* that he thinks might help him make his point, regardless of how untrustworthy or incorrect it is. I have watched a number of those videos, and the 'evidence' that Daniels gives in them is not evidence at all. Why do they keep refusing to have the parchment and ink radiometrically dated like they do for all the other ancient manuscripts? I'm so sorry I didn't see this and respond sooner. The simplest answer is that there is no credible reason to doubt the age of the manuscript. The people who claim it is a fake have zero experience with manuscripts, as far as I can tell. They are not properly trained on how to detect manuscript forgeries and are not credible voices when claiming that perceived 'anomalies' point to forgery. The people who *are* experienced with manuscripts and in a much better position to assess the authenticity of a document that claims to be ancient all think that Sinaiticus really is ancient, and I do not know a single exception. That being said, your statement "like they do for all the other ancient manuscripts" is incorrect. It is pretty rare when that is done. I can only think of a handful of manuscripts that have been radiocarbon dated—some Dead Sea Scrolls, the Jesus Wife fragment and its Lycopolitan John counterpart (note: this was after the allegations of forgery started coming in because the first people to think the Jesus' Wife Fragment was a forgery were manuscript experts—not so with Sinaiticus), Codex Tchacos, and maybe a handful of others. With "Archaic Mark", it wasn't radiocarbon dated (I don't think), but instead, the scientific analysis determined that pigments used in its illustrations did not exist in antiquity. There were suspicions in the academic community that it was a fake long before it was tested. Don't believe the lies or untruths that I hear from the KJV-only crowd regarding Archaic Mark. It wasn't some unquestioned champion manuscript that everyone believed to be real until it was tested. And what would it accomplish if it were dated and proved to be early? The people claiming that it is a forgery have already ignored so many other clear and objective problems with their theories. Not a single one of them has convinced me that they are interested in the truth, only what they can spin to support their own case. I wish even one of them would prove me wrong and publicly recant even one false statement that they have made about this manuscript being a fake. I would love to be wrong, but I fully expect that if for some reason the British Library carbon dated several pages of it and found them all to be 4th century, the "Sinaiticus is a fake" crowd would just say "yeah, but Simonides just used OLD parchment when he wrote it in the 1800s". What's the point of destroying part of a manuscript when all the credible voices say that there is no reason to doubt it, and none of the non-credible voices seems willing to be convinced anyway? Edit: "The people who claim it is a fake have zero experience with manuscripts, as far as I can tell." I need to correct that statement. There is *one* Sinaiticus denier whom I came across who might have some experience with at least one Latin manuscript, but I haven't spent the time verifying that yet.